GEOFFREY CIANI: Hello Olandrewau. How is everything going today? OLANREWAJU DURODOLA: Oh! Everything is going fine, thank you. CIANI: Great! Now you’re coming off of a fourth round stoppage against Victor Barragan last month. How would you evaluate your performance? CIANI: Okay, now this was your third victory this year already, and your sixth victory dating back to October. So you’ve been fairly busy. Do you intend to continue remaining that active for the rest of the year? DURODOLA: Yes, I would like to fight every month if that were possible. A more likely pace will be a fight every two months or so. I’m just waiting for my managers, Kenny Ogaga and Roland Jankelson, to tell me what’s next. I want to be very active in defending the WBC Continental Americas Title. 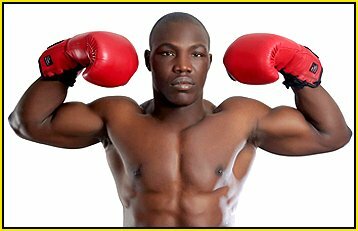 CIANI: When do you think you will be ready to mix it up against the top cruiserweights in the world? DURODOLA: I’m ready right now. CIANI: Okay, now as an amateur, you actually had three victories against Lateefe Kayode. What do you think enabled you to have that type of success against him as an amateur? DURODOLA: I would like to think it was because of the skills I am bringing to my professional career. Also, as an amateur I had the same dedication and trained very hard which is how I conduct myself now that I am a professional boxer. I always want to be in better condition than my opponents and I know that no matter how hard they train they cannot come into the ring in better condition than I bring to the fight. Also, I think much of a boxer’s success is the mental aspect. I believed I could beat an elite boxer like Lateefe, so it happened. CIANI: Your last victory against him was in the Olympic trials, and ultimately you did get to compete in the 2008 Olympics. What was that whole experience like for you? DURODOLA: It was a wonderful experience. But I knew after the Olympics that I wanted to move on to pursue my goal of becoming a World Champion as a professional boxer. CIANI: Now on another note, I was told that you worked as a police officer in Nigeria. Has that experience working in law enforcement helped with your boxing career, and if so, how? DURODOLA: Yes, it did. I learned a lot from my experience on the Nigerian police force: dedication to doing a job well, how to focus on difficult goals, how to believe in my abilities. CIANI: Now you currently have just one loss in your career. What did you learn from that setback? DURODOLA: I learned not to take anyone for granted or underestimate any boxer. That fight was an eye opener for me, and made me work even harder to become an even better and more complete fighter. That one loss gave me motivation that I will never forget. CIANI: If you could land an opponent against any cruiserweight in the world sometime within the next year or so, who would you like to fight? DURODOLA: I would like to fight anyone in the top ten world rankings: Dmytro Kucher, Ola Afolabi, BJ Flores, Thabiso Mchunu, and there are others. I am willing to fight any and all of these guys to prove that I am better than they are. And of course, I want to fight whoever is the World Champion. For now, I can only keep winning and wait for my turn. CIANI: Now you recently made a change, or rather an addition, to your management team. Of course I’m referring to the fact that you’ve added a co-manager, Roland Jankelson, on board. Roland has guided several fighters to World title fights. How did you meet Roland and how is he helping you? DURODOLA: We are a team. Kenny Ogaga has been my manager. Kenny brought me to the United States from Nigeria and has been with me from the beginning. Kenny and I met Roland when I fought on a card promoted by Kim Woods, Roland’s daughter. Roland managed Chauncy Welliver, and Chauncy was the main event on that card that I also fought on. Roland and Kenny started talking about working together and that is how Roland became involved. Again, Roland and Kenny work together as a team and work hard to help me achieve my goals. CIANI: For my final question Olanrewaju, you’re 32 years old now. What would you ultimately like to accomplish in professional boxing? DURODOLA: I would like to show that I am the best Cruiserweight in the world, and then move to Heavyweight and become the Heavyweight World Champion. CIANI: It was an absolute pleasure getting the chance to speak with you here today, and I wish you all the best success in the future, both inside and outside the ring. DURODOLA: Thank you very much.